Explanation: It’s back. Never before has an observed supernova been predicted. 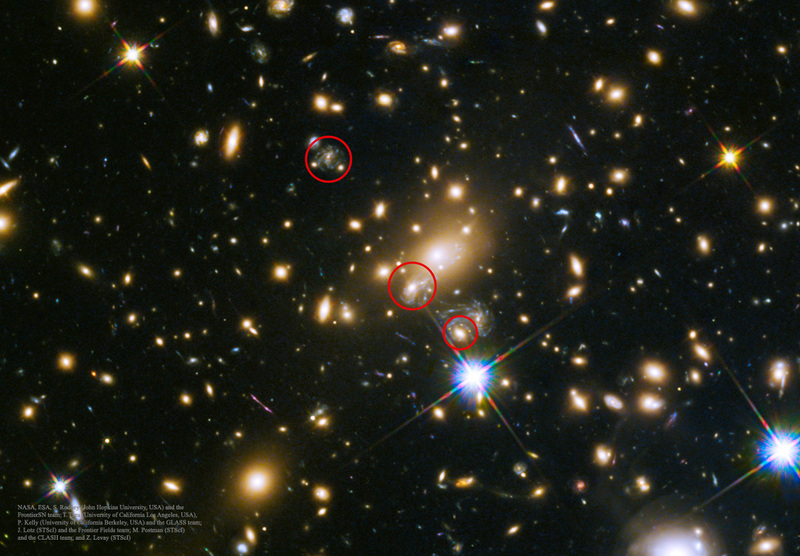 The unique astronomical event occurred in the field of galaxy cluster MACS J1149.5+2223. Most bright spots in the featured image are galaxies in this cluster. [Cluster of galaxies… and yet the least of angels could manipulate it all, and a single soul – your soul – is more precious!] The actual supernova, dubbed Supernova Refsdal, occurred just once far across the universe and well behind this massive galaxy cluster. Gravity caused the cluster to act as a massive gravitational lens, splitting the image of Supernova Refsdal into multiple bright images. [How many of you knew that gravity bends light. Cool, no?] One of these images arrived at Earth about ten years ago, likely in the upper red circle, and was missed. Four more bright images peaked in April in the lowest red circle, spread around a massive galaxy in the cluster as the first Einstein Cross supernova. But there was more. Analyses revealed that a sixth bright supernova image was likely still on its way to Earth and likely to arrive within the next year. Earlier this month — right on schedule — this sixth bright image was recovered, in the middle red circle, as predicted. Studying image sequences like this help humanity to understand how matter is distributed in galaxies and clusters, how fast the universe expands, and how massive stars explode. Go there for lots of fascinating links and a really big version of the image. One day your Earth’s yellow sun will die. Your soul, however, will never die, no matter where you are, heaven or the other place. This entry was posted in Just Too Cool, Look! Up in the sky! and tagged super nova. Bookmark the permalink. I sure hope that God lets me into heaven, because one of the things highest on my list of things to do there is to explore the universe, and do a (pardon the expression) bang-up job at it. With all the millions (?) of galaxies out there, it should keep me busy for several billion “years”. Pictures like this just whet my appetite! Compared to the vision of God, the universe will seem like nothing, impossible as that is to imagine. Let’s hope most of us make it.